Dave Cooper was the State Underwater Archaeologist for the State of Wisconsin and currently works with the National Park Service as Chief of Resource Management at Grand Portgage National Monument. 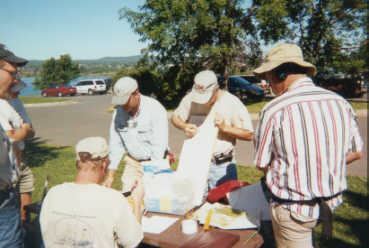 The class was held on August 24-25 at Two Harbors, Minnesota. Participants dived on and mapped the Samuel P. Ely. They learned basic sketching, triangulation, offset measurements, and basic ship architecture. Dave Cooper instructs GLSPS divers in the fine points of documenting areas of ships. Several reference books were on hand to show examples of ship construction. 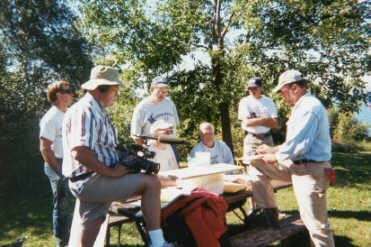 Pictured standing (left to right) are Ken Knutson, Jay Cole (Videographer), Byron Meyer, Randy Beebe and Dave. Bob Nelson and Bob Olson are seated at the table. Dave also showed triangulation method on the ground using measuring tapes. Steve Daniel shared techniques for drawing features of a ship underwater. Complex forms of ship construction are broken down into combinations of simple shapes and lines. The underwater drawings made with pencil on matte polyester sheets are later transferred to paper on the surface and refined. Instruction took place in the park near the Two Harbors Lighthouse. Some artifacts from the ELY, including the bell, could be viewed in the light house museum shipwreck display. 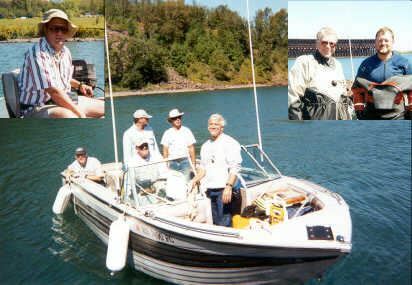 Bob Nelson pulls his boat up to the breakwater with happy Bob Olson in the bow. Byron, Dave and Ken anxiously wait at the stern to apply their new skills underwater on theELY. Jay Cole (inset, left) motored out to record the class activity with his video camera. The underwater portion of the class involved laying a baseline, measuring portions of the ship from the baseline and drawing interesting features of the ship. Several large artifacts, such as the centerboard winch, were also drawn. Steve and Dave (inset, right) suit up to dive.